Dream Burger? 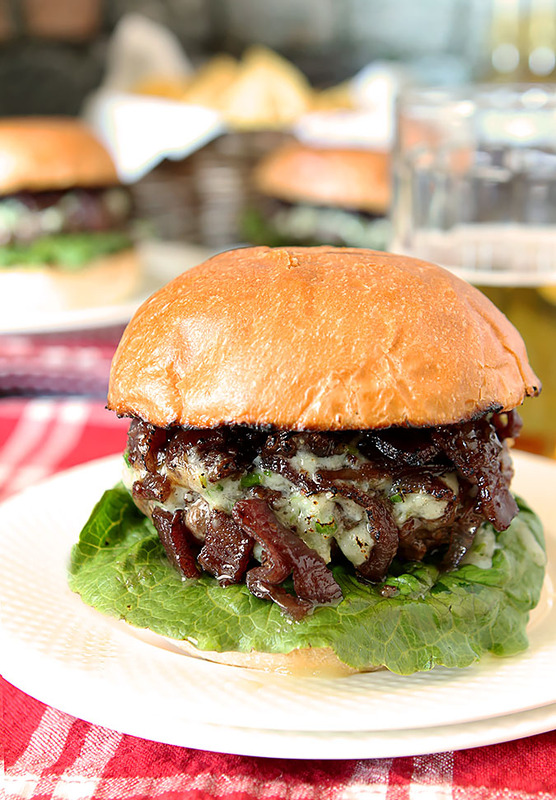 Simple, it would have to be this Blue Cheese Bison Burger with Bacon Caramelized Onions! I don’t participate in a lot of group events; I just really like doing my own thing and not feeling any pressure to perform according to a schedule. When I do participate? It’s for fun; pure and simple. To that end I have my own monthly Progressive Eats where we move from blog to blog instead of house to house with the dish we’ve each decided to bring to the party. This month it’s all about the cookout. Hosted by Jenni Field and her blog Pastry Chef Online, participants have got you covered with foods to be cooked and consumed outdoors, something I love to do all summer long; how about you? I also recently joined a new baking group started by my friend Kelly; Baking on the 15th is meant to be a challenge and with choux pastry our first effort (we made this Strawberry Choux (Cream Puff) Cake) and a souffle for next month, this effort might kill me. I’m at 6200’…challenging enough! Come join us whether you have a blog or not; all you need is a love of baking and an adventurous spirit! The third group I love is an annual event organized by Kita at Girl Carnivore. It’s all about the burger. Burgers, burgers and more burgers! Thirty days of burgers; each day with several bloggers offering their own unique take on a burger they have made and loved. There is beef, lamb, turkey, veggie and more…you really must check all of them out. 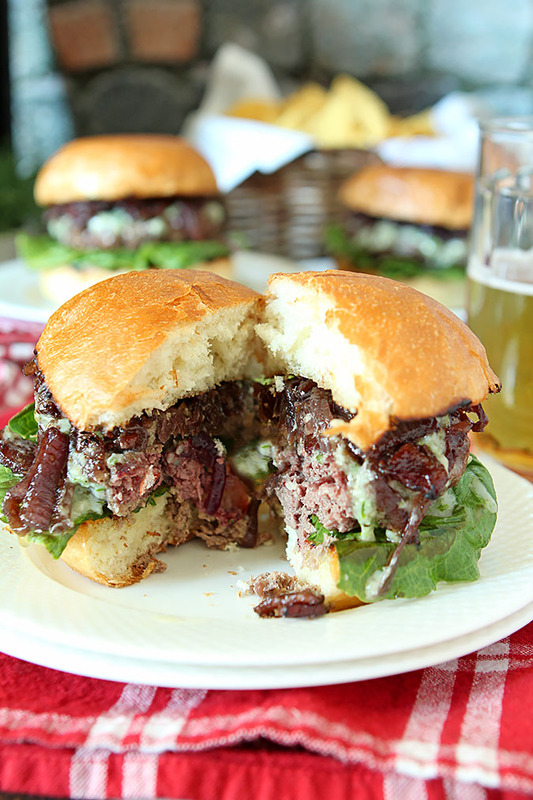 Even if I do think my Blue Cheese Bison Burger with Bacon Caramelized Onions would be hard to beat! Many, many thanks to all of the sponsors for their contribution to the success of this event each year and for providing great products for prizes during the Burger Month 2017 celebration. Follow along on Instagram with #GirlCarnivore & #BurgerMonth to see every burger recipe featured! 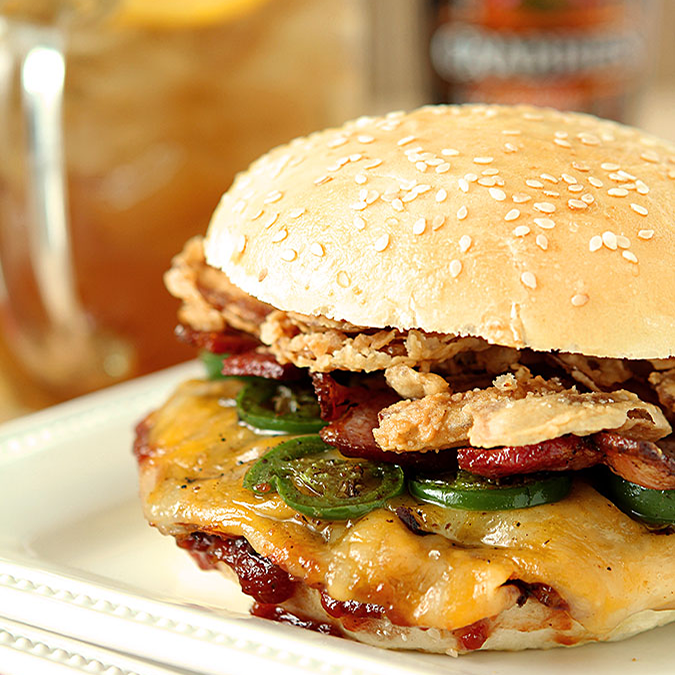 Check Girl Carnavore daily for new over the top burger recipes and earn more chances to win! Because Burger Month 2017 and our Progressive Eats Cookout event happened in the same month I decided to make a burger and dedicate this post to both. While I do love the occasional steak (this one is my all time favorite presentation) and certainly pull a ton of chicken off of the grill each year, I am still and forever will be a fan of the burger. The truth is that the burger itself is sort of like the lettuce in a salad…it’s a good base but it’s the condiments that make it or break it. The first year I participated in the Burger Month event, I made these Lamb and Goat Cheese Burgers with Cabernet Sauce using lamb from the American Lamb Board. A lamb burger is finished with a beautiful Cabernet sauce and then topped with goat cheese and crispy onion rings. I want another one NOW! I followed that unique burger with one I recreated after visiting Ted’s Montana Grill. The Canyon Creek Burger is amazing and once you have a burger that combines jalapeno with a sweet jam, I promise you will love it too! Why yes, that is a fried egg! My venture with Burger Month 2016 resulted in re-creating another restaurant special. Smashburger offers this Spicy Cowboy Burger occasionally and I happened by one night when it was available. The spicy did it for me but honestly I could get used to that notion of onion rings on a burger…they are the bomb! I was especially proud of my homemade Sesame Hamburger Buns; they were SO perfect! This year I decided to use bison meat since Colorado has such a large bison population. I’ve been here for 30 years and remember the first time we drove to the mountains and saw a herd moving across the plains down below. It was very emotional; to think that these animals have survived for so many years and were such a part of the history of the west. Sadly their numbers were diminished from mass slaughter at the hands of man. They are now making a comeback and carefully managed herds and better health practices have seen a rise in their numbers. In my area of South Denver, there are a couple of farms within an hours distance where you can purchase fresh bison meat but I’m seeing it even more widespread the last few years in local markets. Last week I found it available at two shops and even our Costco. Bison at Costco…is that something available at yours? I decided to try another re-creation albeit with a burger I’ve never actually had! When a friend accompanied me to Ted’s Montana Grill to sample menu items, while I enjoyed the Canyon Creek Burger shown above, she decided to order the Blue Creek, a Bison Burger that had Blue Cheese and a tasty combination of grilled onions with bacon on top. I’ve long wanted to get back for one of those but decided instead to put my own spin on it for today. We are after all, PROGRESSIVE Eats right? I forged ahead with a recreation that included Bison, Gorgonzola Cheese and an amazing combination of bacon, onions, and red wine that resulted in a topping so tasty I had to hold myself off from finishing it with a spoon! 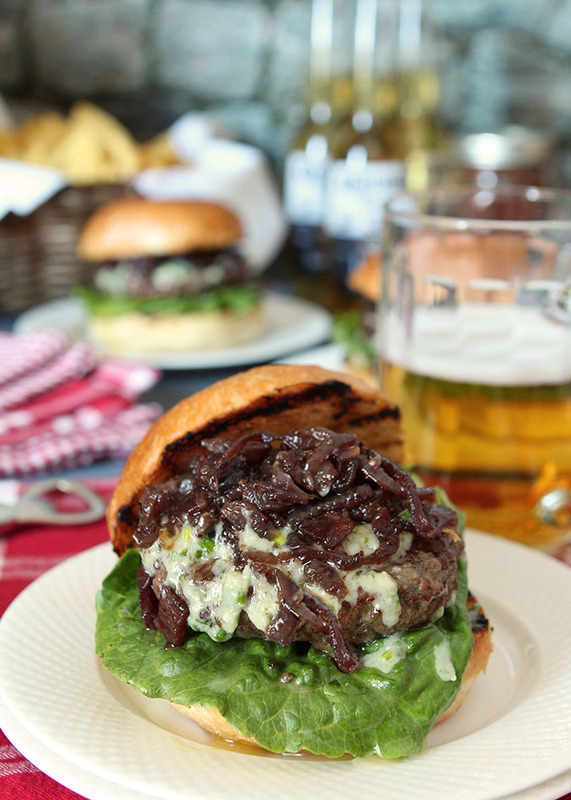 Yes, I’ve still called it a Blue Cheese Bison Burger but for me, Blue Cheese and Gorgonzola are interchangeable and I more often have the bit less pungent Gorgonzola in my fridge. Use either one for preparation; both would be great. Bison is not gamey but it is lean. While there is some fat in the meat I was taking no chances so I put in a bit of the fat that was rendered from the bacon. These burgers cook FAST and if you’re the well done type? Don’t do bison, it really should be only cooked to rare or medium rare; any more and they will dry out to the point of ugh. Better to substitute with a fattier meat and just use the ground beef you usually buy for burgers. Be sure to check out all of the fantastic dishes for our Progressive Eats Cookout event that are listed after the recipe. I want them all…this virtual business is fun but nothing like getting to have an actual taste; which would you put on your menu? Saute bacon over medium-high heat until fat has rendered and it is just starting to brown. Skim off fat and set aside. Add the onions, sprinkle with salt, and sauté until tender and golden brown, stirring often, about 10 minutes. Reduce heat to medium and continue to sauté until very tender and well browned, about 15 minutes longer. Add mustard and wine and cook, stirring occasionally, until liquid is absorbed, about 5 minutes. DO AHEAD: Can be made 3 days ahead. Cool, cover, and chill. In a small saucepan over low heat combine the butter, minced green onion and garlic and simmer for 1-2 minutes on medium heat. Add the crumbled blue cheese and warm slowly until the cheese has melted and the sauce is creamy. If the sauce starts to separate, whisk until it combines together again. Preheat grill. Gently mix buffalo meat with 2 Tbsp reserved bacon fat, onion, garlic powder, salt and pepper in large bowl. Shape into four 1/2-inch-thick patties. Grill on high heat until well browned, about 2 minutes per side for medium-rare. Open buns and arrange, cut side up, on top of grill. Leave on grill until lightly toasted, about 1 minute. Spread bottom halves with about 1 tsp of cheese mixture. Top each with romaine leaves, then burger. Dollop with another tablespoonful of the Blue Cheese Sauce. Spoon onions atop burgers, dividing equally. Cover with bun tops; press lightly. Serve. Like a larger burger? Make three burgers and cook on each side only about a half minute longer. Enjoy more Dishes from our Progressive Eats Cookout! And don’t forget to hop over and ENTER TO WIN! some great prizes from Burger Month 2017! Welcome to Progressive Eats, our virtual version of a Progressive Dinner Party. Our menu this month features recipes that would be perfect for a summer cookout! We had a lot of fun creating them, and hope you’ll enjoy trying them, too. Our event this month is hosted by Jenni who blogs at Pastry Chef Online. Our menu includes everything from beverages to bread, an entree to sides, and of course some desserts so we can finish on a sweet note. Oh my goodness. Each and every one of these burgers makes me drool – but my heart does belong to your ProgressiveEats contribution. 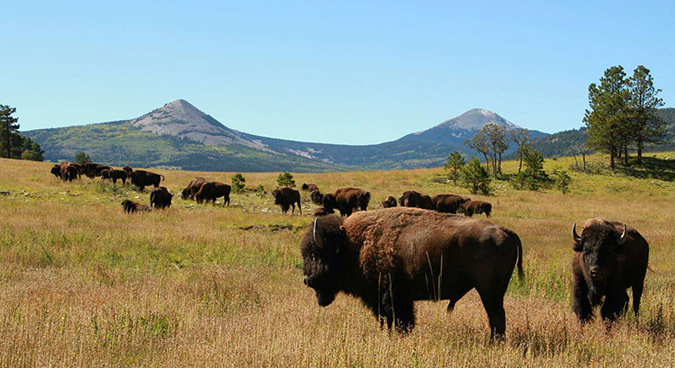 I must run out and find bison meat (not so easy in my mid-Atlantic grocery, I’m afraid. But I will persevere, if the reward is a burger as yummy as yours. I have never had a Bison burger before and I wish I could have one of these right now. With your recipe, all I need is the meat and I can make it myself. I just might be doing that this weekend. Once again another superb recipe! Oh Barb ~ my husband would marry me all over again if I made him any one of these burgers, he loves bison, but I’ve never tried it! Mmm, burgers! Who doesn’t crave them from time to time? This looks wonderful — all my favorite burger toppings. Thanks! I just ate a burger yesterday but totally want to start over and try this one. A burger worthy of Burger Month, for sure! And I’m so glad you also made it the centerpiece of the Progressive Eats meal. Perfection! We can get bison in 2 1-pound packs at our local BJ’s Warehouse. I try to always have at least one pound on hand for times like these! Wow Barb, this is definitely an Epic Burger!! I love the flavor combination and of course your photos are beyond gorgeous! I should not have stopped by before eating – now I’m starving and all I want is a burger, LOL. Oh, my. Now I’m craving a burger and it’s barely passed breakfast time. This is one spectacular entree!! !